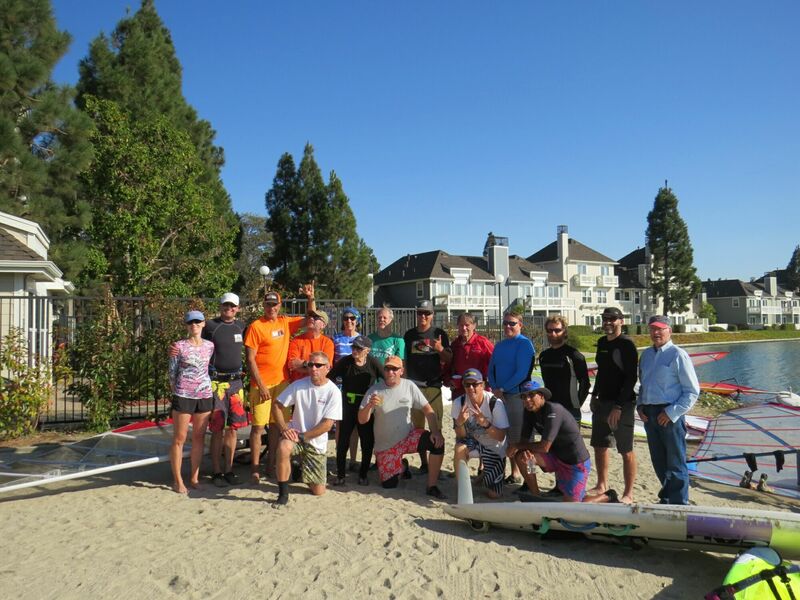 Every year in late October, the crew from Fleet 18 (over in Foster City, California) gets together for the Margarita Run. You must have heard of it: it’s one of the country’s most unusual longboard races, a bit of a bar crawl set on a meandering residential waterway they call ‘Central Lake’ that looks nothing like a lake and is barely 200 ft wide as it loops almost 360 degrees around the neighborhood! Fun as hell, of course, and this year, they celebrated the event’s 30th anniversary! Fleet 18 was founded by Glenn Taylor (together with Skip Harrison and Mike Horgan) in 1973, and at its peak boasted over 60 racers every Tuesday night for its weekly race series. Conceived by Charles Howard in 1989, the Margarita Run is Fleet 18’s end of season race (and party! ), with the second leg being handicapped both by margaritas, and a reverse pursuit based on elapsed times for the first leg. 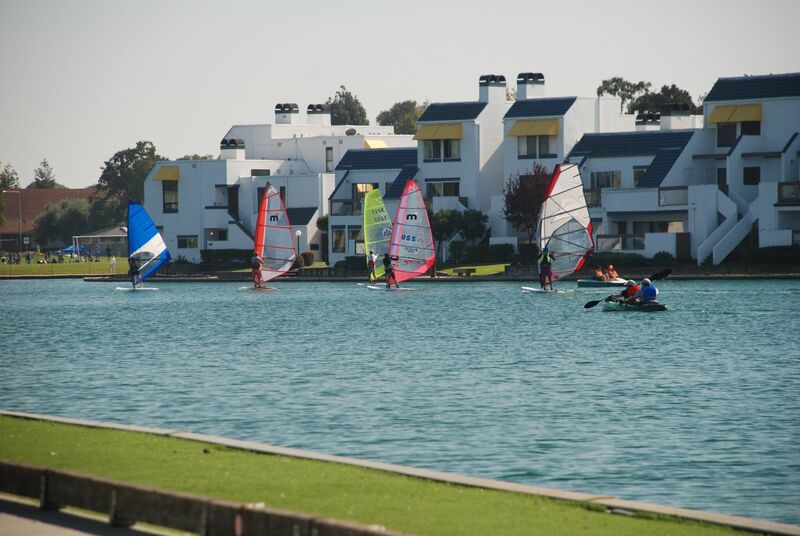 The race takes sailors over 7 miles through the channels and bridges of Foster City. Here’s how it goes: we start from Ryan Lagoon (the widest part of the course, at the top-left of the picture above), and after a short upwind leg, the course heads east to pass under Shell Blvd, all the way to the Foster City Blvd bridge where the two pilings are treated as a single mark rounded to starboard. After an upwind leg back to the lagoon, the second channel is followed to its end. This first leg ends at a beach, where the arrival time of each sailor is recorded, and the participants share baguettes, cheese, chips – and of course margaritas! After the time differences have been computed and the party food and beverages are gone, the last person to finish starts the return race. The clock then begins for the second-to-last finisher to start, and the time between starts for each racer is the difference in times between the first leg finishes. This process continues until the first-to-finish starts. In theory, with this handicapping, all sailors should arrive at the finish line together! However, as winds usually pick up later in the afternoon, the faster sailors have quite a challenge to make up the difference with those leaving ahead of them, notwithstanding the effect of margaritas on coordination and balance! The return leg “unwinds” the first leg, going the reverse direction around all bridge pilings and buoys, usually involving a lot of tacking and ending with a downwind finish. Prizes are awarded for the first finisher of each leg, and the overall shortest elapsed time. 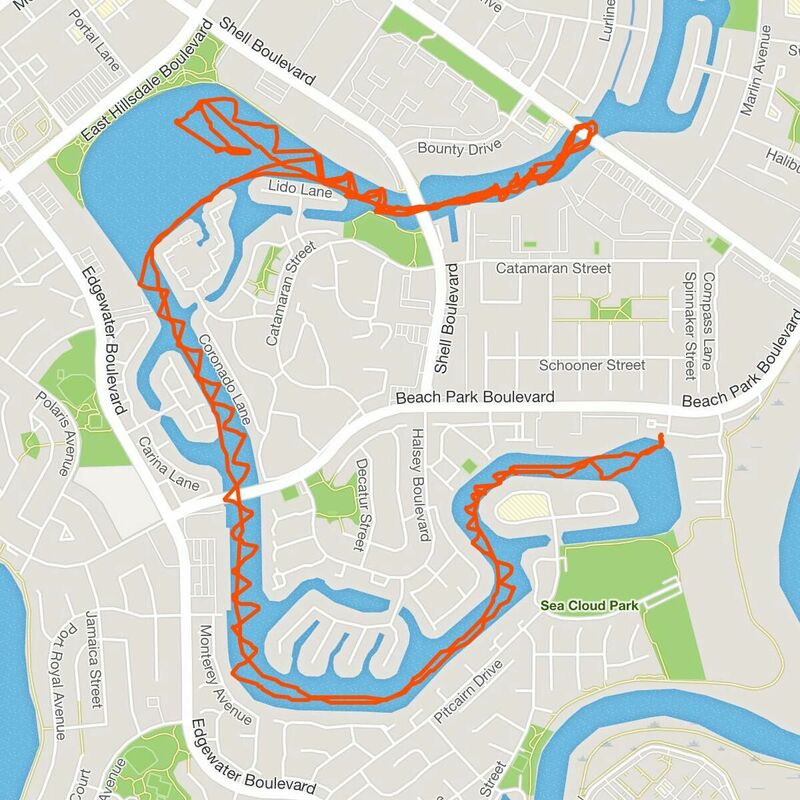 This course is also sailed as a season opener, now known as The Glenn Taylor Memorial Race, following the same reverse pursuit format, but with beer supplanting margaritas at the halfway point. The next Memorial Race is expected to be in April 2019. 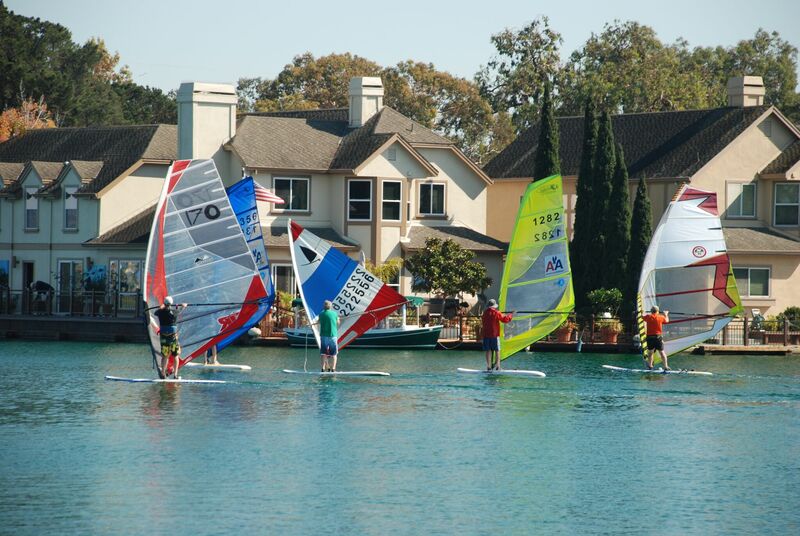 The standard equipment for Fleet 18 races is currently a Kona 7.4 One Design sail with a Superlight II board, but any sail or race board is welcome. It’s a challenging course: typically the wind for the first leg is lighter than that for the second, at which time it can reach 20+ knots. The biggest challenge in this race, however, is dealing with the very complicated shoreline bordering the course. Apartment buildings, bridge pilings and gaps where roads end beside the water make the wind erratic. There are a few dogs in back yards that will bark at contestants but in the thirty years this race has been run, no dog has swum to a sailor’s board in an attempt to bite. It is a good idea, however, to give the dogs “searoom” and tack away from them five yards or more from where they stand on shore! And the seawalls have obstructions at their base which in many places will kick up the centerboard too. For all those reasons, clearance for the walls of at least five feet is a good idea! Sounds like a hoot, doesn’t it? This year, we raced the Margarita Run on a beautiful warm sunny day, with highs near 75 degrees, and the wind was rather light (0-5 kt!) from the northwest, which made the race quite challenging. 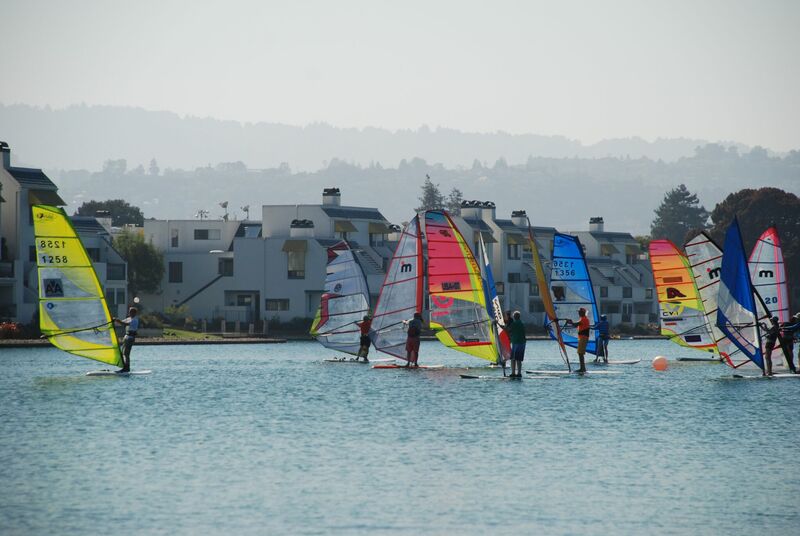 We had a great turnout with 17 competitors, sailing everything from original windsurfers with teak booms and windsurfer one designs, a D2 board, Konas and many raceboards from the 80s and 90s. Newcomer Alison Rowe pulled off an amazing first leg! 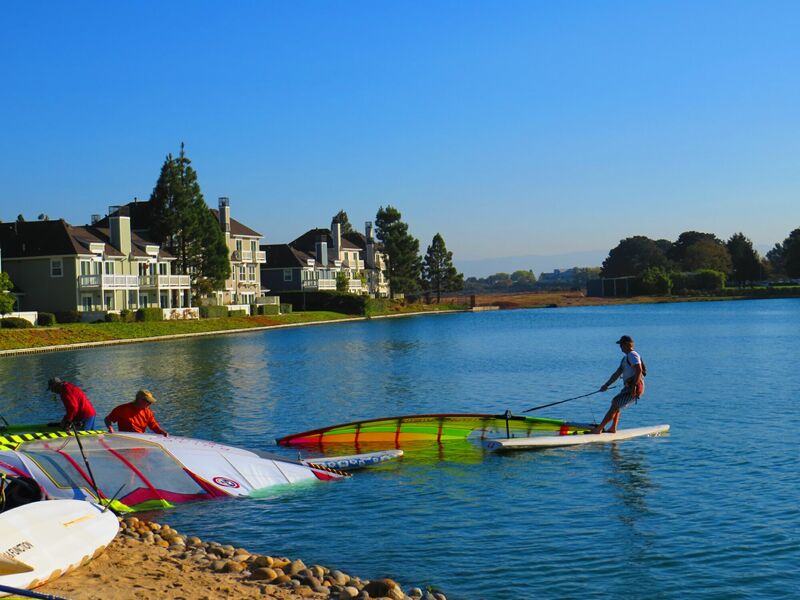 She borrowed a Windsurfer one design rig from me and navigated the light and variable conditions perfectly to ace the fleet to the first mark. There wasn’t another board within 10 lengths of her! The other highlight of the day was the completion of the course by 89 yr old Feliks Dozorets. Felix ran a modified B-fleet course, which is downwind only, and completed the course without a hitch. Way to go Felix! You always are an inspiration to me. The winners of this year’s race were Mark Zimmer on the first leg, Ward Greinke on the second leg, and yours truly for overall time. It was tight: nearly 2 1/2 hours total racing, and I edged Mark by 43 seconds in the end! Well done everyone! Special thanks to longtime Fleet 18 member Rolf Jaeger who sat out with an injury and ran this year’s race. Check out Fleet 18 on the web and on Facebook, and make plans to come and race with us next year! Next story 2019 US Windsurfing Nationals to be held in Hatteras, Worthington and Maui! Previous story Clearwater delivers for the 2018 Kona Worlds!